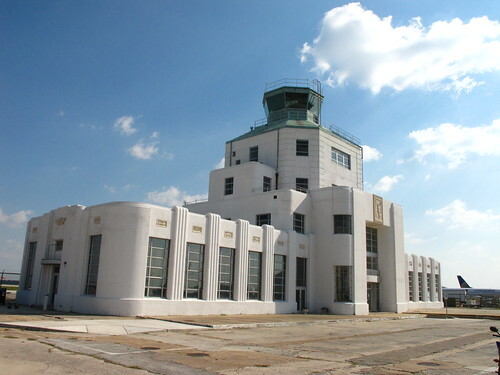 Flickr user Chris Cornwell captures the Art Deco glory of the former Air Terminal of Houston Municipal Airport (now William P. Hobby Airport, KHOU). Houston Texas Hobby Airport 1940 Air Terminal Museum 2009 art-deco heritage aviation Exhibits history Aeronautical Building Signs IMG_1586, originally uploaded by mrchriscornwell. Houston Texas Hobby Airport 1940 Air Terminal Museum 2009 art-deco heritage aviation Exhibits history Aeronautical Building Signs IMG_1559, originally uploaded by mrchriscornwell. 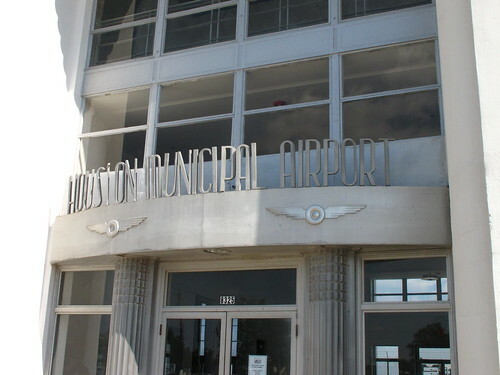 Houston Texas Hobby Airport 1940 Air Terminal Museum 2009 art-deco heritage aviation Exhibits history Aeronautical Building Signs IMG_1560, originally uploaded by mrchriscornwell. Houston Texas Hobby Airport 1940 Air Terminal Museum 2009 art-deco heritage aviation Exhibits history Aeronautical Building Signs IMG_1573, originally uploaded by mrchriscornwell. Houston Texas Hobby Airport 1940 Air Terminal Museum 2009 art-deco heritage aviation Exhibits history Aeronautical Building Signs IMG_1565, originally uploaded by mrchriscornwell. Houston Texas Hobby Airport 1940 Air Terminal Museum 2009 art-deco heritage aviation Exhibits history Aeronautical Building Signs IMG_1562, originally uploaded by mrchriscornwell. Houston Texas Hobby Airport 1940 Air Terminal Museum 2009 art-deco heritage aviation Exhibits history Aeronautical Building Signs IMG_1556, originally uploaded by mrchriscornwell. See the complete Flickr set for more. As aired on KTBU (Ch. 55) in June of last year. 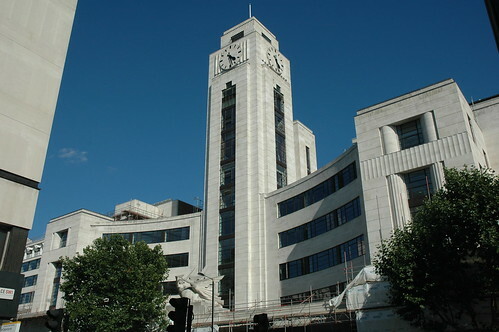 Imperial Airways Building SW1, originally uploaded by Jamie Barras. 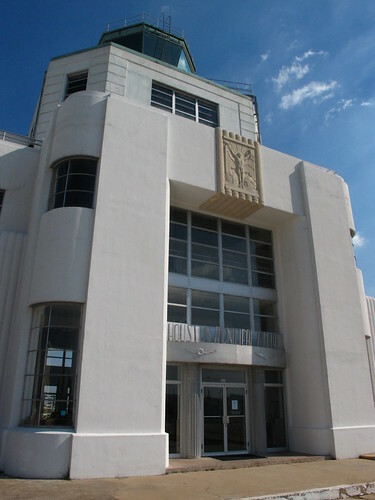 Designed in 1938 by architect Albert Lakeman, the Empire Terminal is a rather striking Art Moderne structure built to facilitate intermodal passenger and freight transport for Imperial’s C-Class flying boat services around the globe. 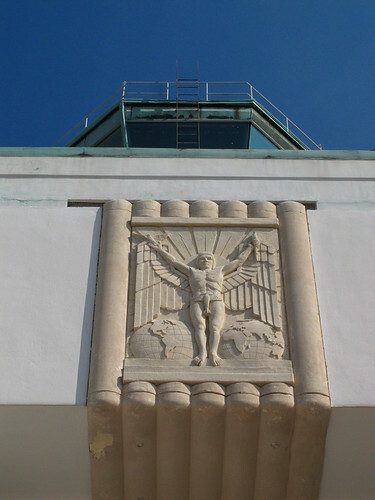 The main entrance features the statue Speed Wings Over The World, by Eric R. Broadbent, as well as the winged insignia of Imperial Airways in bas-relief. 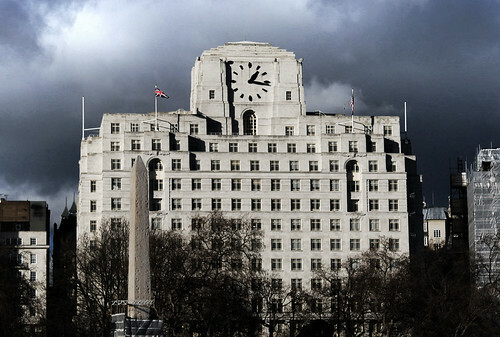 The terminal is a lengthy facility stretching from 157-197 Buckingham Palace Road (Westminster SW1), and was completed in 1939. It is strategically located adjacent to major road and rail connections, lying across the street from Victoria Coach Station and backing onto the railheads leading into London Victoria train station. 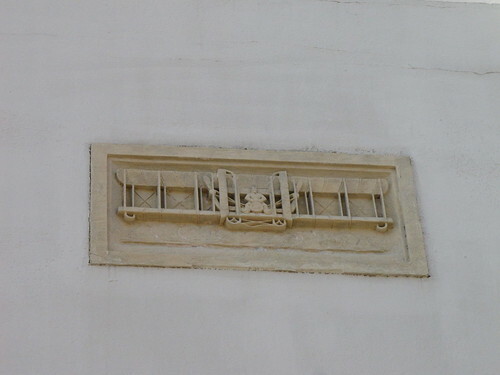 This ideal situation allowed mail, freight and passengers to congregate at the Empire Terminal, then be shipped to Southampton via rail, where they would be loaded into the flying boats and dispatched to the far corners of the earth. Despite the general decline of flying boats in the postwar era, Imperial’s successor companies—BOAC and British Airways—continued to operate the terminal into the late 20th century. In this 1978 image, the British Airways tail flash is visible atop the terminal’s central clock tower. At some point, BA management sold off the terminal and consolidated its offices elsewhere. 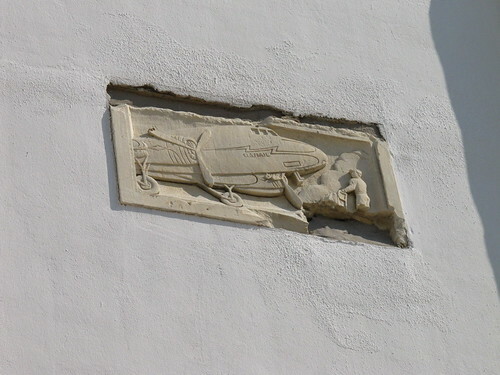 I am a little hard-pressed to comprehend how BA could easily surrender such priceless architectural and corporate heritage—with its predecessor’s logo painstakingly wrought from the very stone above the entrance—to any other body, regardless of how worthy. Although given the state of Ford’s original Model T plant in Highland Park, Detroit, I suppose I should not be surprised by a company’s tone-deafness to their own rich history. 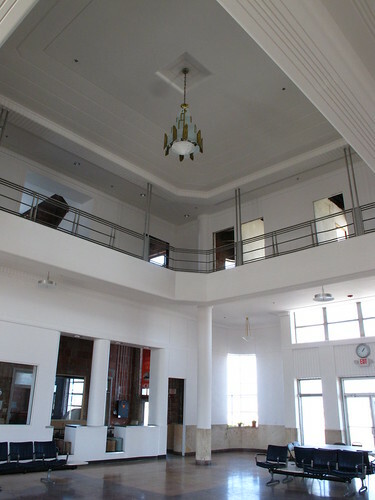 Today, the Empire Terminal is home to the UK’s National Audit Office, an independent parliamentary body that reports to the Comptroller and Auditor General. A collection of Art Deco / Art Moderne buildings sourced from Flickr. Shell Mex House, originally uploaded by rich9973. 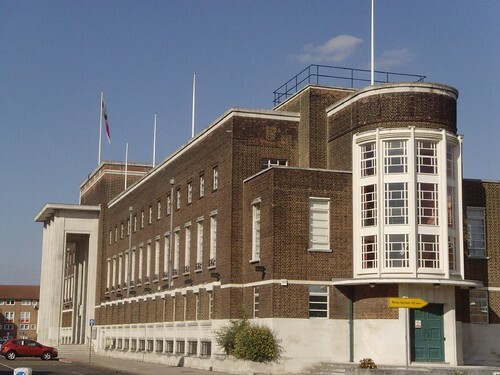 london art deco: Dagenham Civic Centre, 1936, originally uploaded by mermaid99. 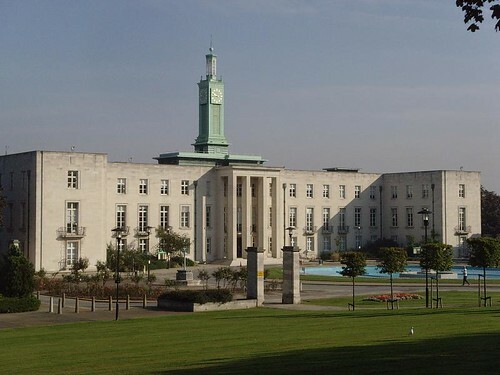 london art deco: Walthamstow Town Hall 1937-42, originally uploaded by mermaid99. 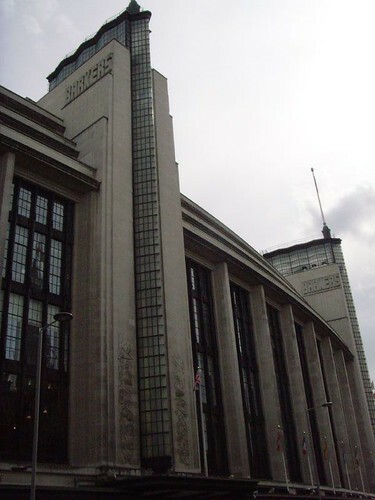 london art deco: barkers department store, kensington high st, originally uploaded by mermaid99.